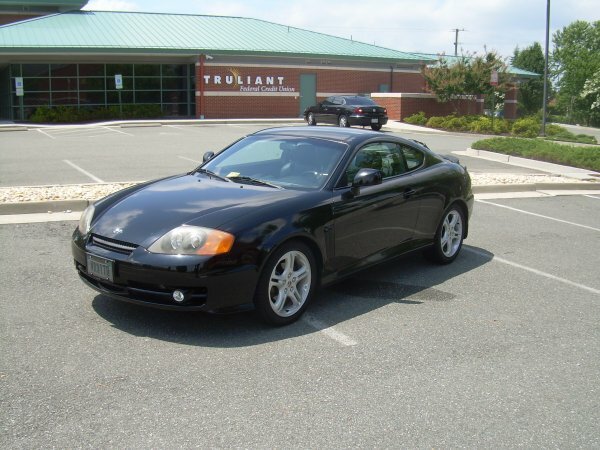 I bought my 2003 Hyundai Tiburon GT in 2003. I made a few small mods to it at the time, but since then, I have just done regular maintenance and repaired things when they have broken. Recently, it has been looking a little sad, and I have had the urge to fix it up to its former glory. This is the story of that process. As required, here is a link to my album. Brands and prices will be mentioned in case someone wants to suggest a better or cheaper alternative (particularly from NT sponsors, whom I want to support when possible). So please make suggestions on alternatives for things I haven't bought yet. I happen to like black-on-black, so I won't be adding metallic or carbon fiber doodads anywhere, aside from replacing badges the car came with (and I won't be replacing all of those). The passenger cup was the first mod I did! And now, complete photographic documentation on my 2010-07-13 starting point. Last edited by bblackmoor; 07-26-2016 at 06:06 PM. There is a fairly obvious "H" outline left on the paint. This is (I believe) because the paint under the "H" is fresh and new, while the paint around it has been subjected to eight Virginia summers and winters. It could probably be buffed out. I may or may not bother. It depends on how much it bugs me. Eventually, the holes in the front will be filled and painted, along with the rest of the car. The back will get a custom "T" logo from ForceFedFlesh. Or I may just have those filled when I have the holes from the spoiler filled. As cool as ForceFedFlesh's badges are -- they are works of art, they really are -- I think I like the plain look in the back. 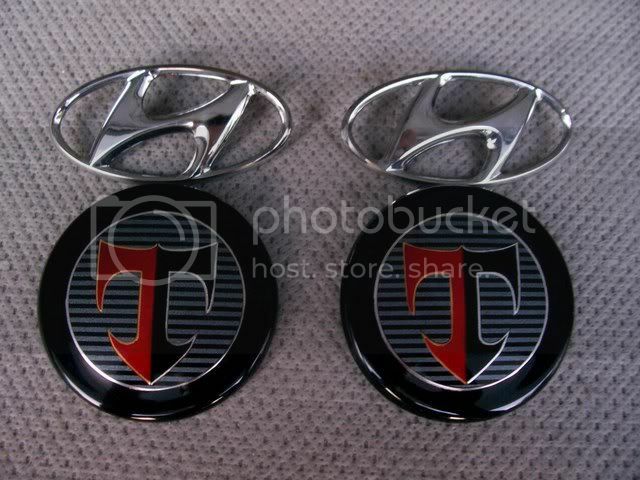 I might buy one of his badges just to have it, and not even put it on the car. Fun fact! I did not know until I took these photos that the black lettering on the back of my car saying "Tiburon" and "GT V" (the "6" is red) glowed like the sun when hit by a bright light (the flash on my camera, in this case). Nifty! I don't plan to replace or remove that lettering, by the way. I have always liked the black lettering on the back, and the red "6". Last edited by bblackmoor; 07-26-2016 at 06:07 PM. 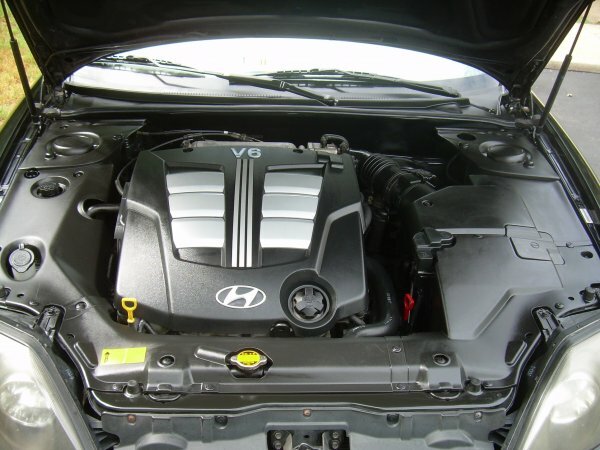 I cleaned the engine compartment. The K&R intake arrived today. 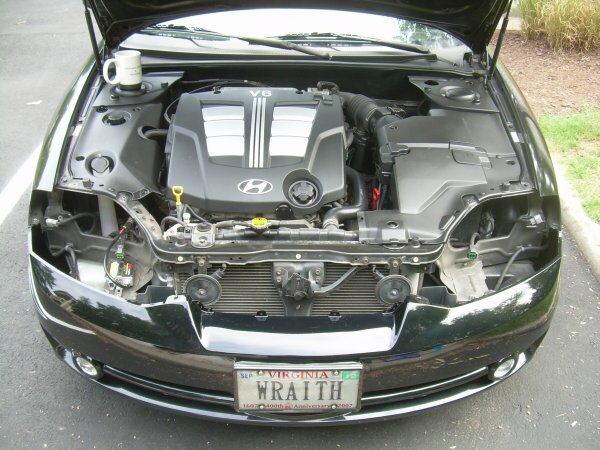 I am planning to hold off on installing it until I get the big bore throttle body. I do not like disassembling and reassembling things over and over. I might even wait until I get a ported and polished intake manifold and phenolic spacer, but I am not sure about that. It depends on what price I can get on an intake manifold set. If it costs too much, I won't be doing that. Last edited by bblackmoor; 07-26-2016 at 06:08 PM. I have updated my wish list, adding brands and prices where I know them. 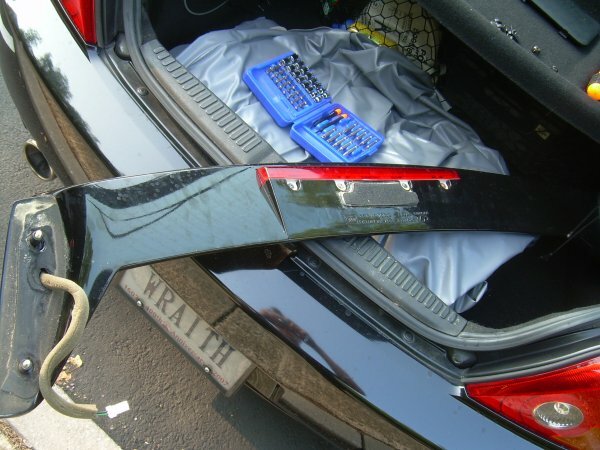 Removing the spoiler and installing an idiotic third brake light. This is not really a DIY, but these are photos of each step. Take a look at the screws holding in the windshield wiper motor -- two of the three screws were already completely loose. It was being held in with one screw! I was going to disconnect the wiper pump, but that wound up being a nuisance, so I just pulled the fuse for the rear wipers. Where the spoiler had been attached to the car, it rubbed lines through the paint and has started to rust. The nylon plugs are a temporary measure. 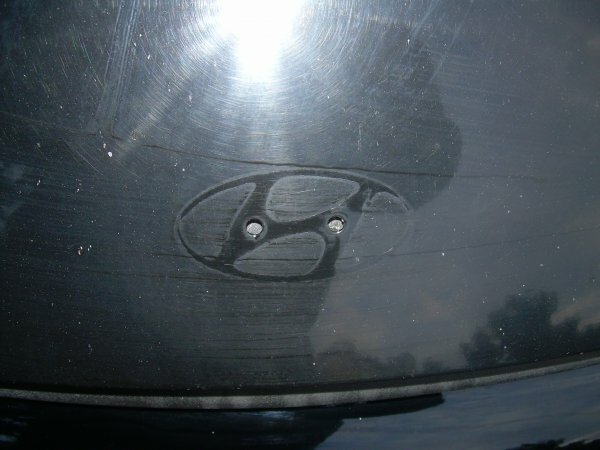 Sealing the holes properly and repainting the hatch would be $800, while doing that and the whole car would be $3500. Chances are, I will get the hatch painted first, since doing just that is so much cheaper. Hooray! I wish I'd done this eight years ago. 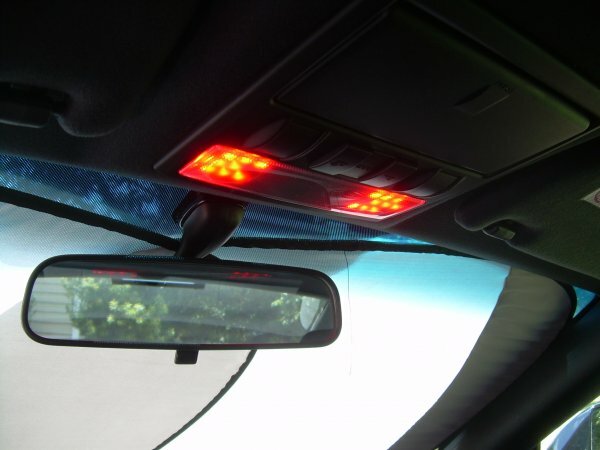 I really like the LED brake light (I mean, I'd rather not have it at all, but if I have to have it, I like this one). So I plan to order another so that I have a spare when these burn out. About of the third of the stock LEDs in the spoiler had stopped working. Last edited by bblackmoor; 07-26-2016 at 06:09 PM. I may need some advice on the installation. I have some Ark coilovers coming. Should I put the strut bars on at the same time as the coilovers? ya i would wait as you need to take of the rear belts to get at the rear struts any way the front is mega easy you can put that on right away two bolts . I installed silver vent rings and the red LED dome lights. Everything looks good, although I wish the dome lights were a better match for the OEM orange/red LEDs. Using the little magnets on the standoffs is brilliant, by the way. if it were me, I would have just used contact cement or something like that. They're ridiculously easy to install. The adjusting them is a little more guesswork, though Optimummind can help you with that, he adjusts his regularly. The front is 3 bolts on the strut tower on each side, then the brake line, and two bolts on the knuckle down where the rotor and stuff attach. The rear is a little more of a pain just because you have to remove the seatbelt retractors, and some of the trunk covers, but then its same procedure, with one extra bolt for the e-brake lines. I replaced the headlights and grill today. I considered painting the grill black. I may still decide to do that. I thought it was particularly handy that the Hyundai engineers provided a place to put my coffee cup while I was working. I installed the grill and the HID low-beam bulbs at the same time. Last edited by bblackmoor; 07-26-2016 at 06:12 PM. I like where your car is going...keep it up The headlights look so much better. I remember when I put mine on...it's like night and day. I'd say keep the grill the way it is until you get more supporting mods...then you'll know whether or not you want to paint it. 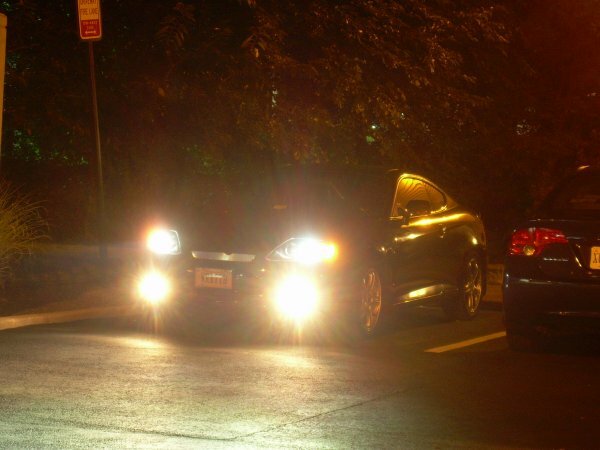 Let me know if/when you want to modify your headlights even further...I'll be happy to give you a hand. Last edited by Shadow Blue; 07-27-2010 at 04:34 PM. I added some nighttime photos of the interior lights and HID headlights. Last edited by bblackmoor; 07-26-2016 at 06:13 PM. Very thorough pics of the installs, your camera does a good job at those night shots. Installed the K&N cold air intake and the 60mm throttle body. Last edited by bblackmoor; 07-26-2016 at 06:14 PM. Cool, nice work. You're a busy guy with this car, kudos man. You gonna do an upper intake manifold next to get rid of the bottleneck after the larger throttle body? It'd be a huge power boost and a good combo mod for you. 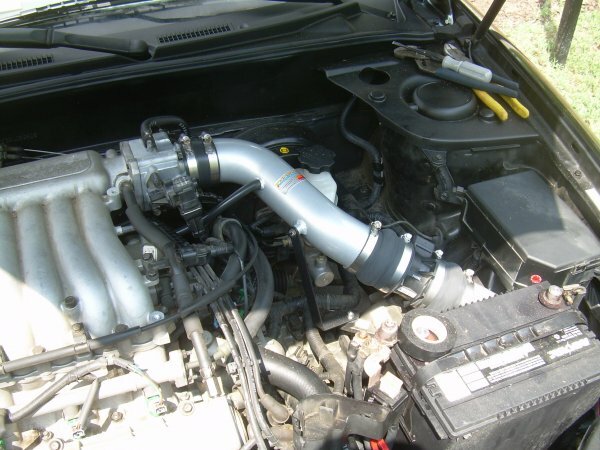 I hadn't actually intended to install a cold air intake. I had intended to install a short ram intake. But once I got into it, I figured, what the hell, why not? Hopefully I won't destroy my engine the next time it rains. The lawn people came by and did their thing while I was in the middle of the CAI installation. I didn't blame them -- they were just doing their job, and they did try to skirt me as much as possible, not that it helped. I took photos of them because it struck me funny. This whole process took about seven hours, and I was completely exhausted and soaked with sweat by the end of it. I drank two cups of coffee and four liters of soda while working on this. The new throttle seems more responsive than the old one, and the engine seems a little louder. I am not sure if that's my imagination or not, but I suppose I may as well enjoy it, either way. Last edited by bblackmoor; 01-06-2013 at 12:55 PM. You gonna do an upper intake manifold next to get rid of the bottleneck after the larger throttle body? It'd be a huge power boost and a good combo mod for you. I wouldn't mind, but that's expensive, and I need to cool off on how much I am spending on this for a while. But I keep finding bargains! The next thing I install will probably be the Ark coilovers (which I hope will arrive in the next week or two). After that, it's probably the exhaust, because the most expensive parts for that have already been purchased. After that, I plan to work on the brakes, but that's a chunk of money, so it will need to wait a while. You can do brakes fairly reasonably - I paid 370 for my setup, and it's way better than stock. Drilled and slotted with stoptech pads - since you do all your installs yourself it should be just the 370, upgrade the lines later. It'll make a world of difference to at least do the rotors and pads. I like your plans though, keep up the good work!